Your Jetsons-esque future could arrive sooner than you think, according to a recent study from Johnson Controls, a Milwaukee, Wis.-based tech and engineering firm that specializes in sustainable products. The company put together a study that looks ahead 25 years to predict what our offices and work days will look like in the future. The authors of the study foresee a future that is dominated by adaptable technology and physical spaces. Apparently robot assistants, smart homes that monitor bio rhythms and driverless cars with work stations will be the norm. The researchers posit that the majority of people will be self-employed entrepreneurs, but if they work for corporations, they will still be self-directed, with a great deal of choice in where they spend their time during the work week -- which in itself is very flexible. Workers will have the option to log time in a linked up home office, a collaborative co-working space or a high energy, networking hub "trophy workplaces" that will be used as rewards for exceptional job performance. Related: Want More Sleep (And Better Productivity)? Work From Home. When these employees and entrepreneurs want to wind down, the authors of the study predict that spaces that are completely tech free will crop up as a destination for relaxation. They also predict that there will be a major emphasis on health and wellness as well as avoiding burnout since work will be so easily accessible. 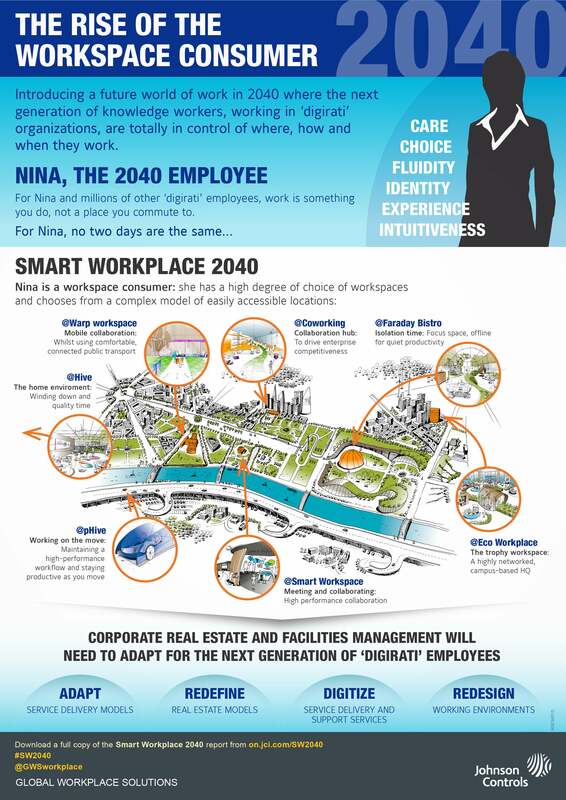 For more on what the workplace of the future looks like, check out the infographic below. 'Innovation' is Hot, Hot, Hot! Expect More of It in the Small Business Sector in 2019.